Meets: 10:30am, first, third (and ​fifth) Thursday of the month, at Bar La Esperanza , Benajarafe. Meets: 10:30am, second and fourth Thursday of the month, at Bar Ri-Jo, in Algarrobo Costa. Whether you have played before or simply want to find out about and perhaps even learn to play the game you will be very welcome. At our first meeting some of us learned that the game is meant to be played as quickly as “rain falls on the roof”. Fear not! We are a relaxed group, with varied playing experience ranging from a few weeks to many years. In China mahjong is a keen gambling game. We intend to lose nothing and just win a few hours having good fun in good company! The game has an affinity to the card game rummy, but with many twists and turns in the rules of play and the system of scoring. 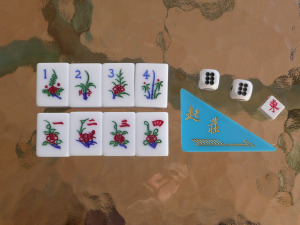 Mahjong can be played using special sets of cards, but we play using sets of tiles which are yet another point of interest – some of us have relatively modern sets made of plastic or similar man-made materials. Others have antique sets made from bone or ancient ivory, sometimes combined with bamboo. They all make for a pleasant, tactile and sometimes noisy experience. Our game makes use of 144 tiles, and each player has the objective of being the first to collect one of various winning combinations. So if you have yet to experience the game, or are simply missing the opportunity to call out the magic words “chow”, “pung”, “kong” or “mahjong” come along and join us. You don’t need to bring anything with you other than your interest and good humour.